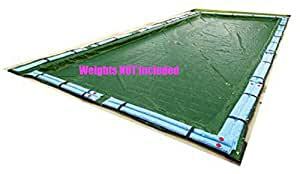 20 Ft x 36 Ft Rectangle (+5 ft Overlap) WINTER COVER INGROUND POOL Ultra Armor Gold – Cover Includes Water Bag Loops, BUT does NOT include any Water Bag Weights: every four feet. Our mid-grade winter pool cover has the is built with strength and durability much like other winter pool covers costing twice as much. With light weight material and the advanced tear strength, these winter covers are easy to install. With a 2″ Hi Strength Polypropylene Binding, these winter covers will withstand winters worst. The non-corrosive grommets allow for a longer life in adverse conditions and will help keep your winter cover securely tied down. Ultra Armor Maxx winter pool covers have U.V. inhibitors embedded in the material to prevent sun degradation, meaning your winter cover will last longer than most other winter covers. Our winter pool coverâs black underside retards algae growth which means a crystal-clear pool this spring. Our winter covers are made from Extruded Polyethelyne Fiber with a UV enhibitor coating which will promote longevity in your winter cover. This fiber is a higher grade than most other winter covers on the market. When you buy an Ultra Armor Maxx Winter Cover you can be assured that the cover is a high quality long lasting winter cover. Why choose any other winter cover when you can own an Ultra Armor Maxx Winter Cover!